The Paint Fire charred 5,000 acres, destroyed hundreds of homes, and killed one woman. A wildfire protection plan for the same area has come under fire. It is difficult to articulate the terror of escaping fire. In the aftermath many find their homes decimated — still smoldering with the remains of their lives. The number of Santa Barbara residents who’ve experienced the panic, fear, and trauma that follows such a catastrophic event has, unfortunately, grown since my experience during 1990’s Paint Fire. But many communities in the wildland-urban areas are writing or have written a Community Wildfire Protection Plan (CWPP) to prepare their neighborhoods against wildfire. The most recent, for the areas along State Route 154, has encountered a disingenuous argument from former CWPP participants. Most structures in the path of the Paint Fire were built with highly combustible material and little defensible space. These same homes have been rebuilt in compliance with updated building codes to increase their chance of survival during the next fire. Homeowners have also become educated on how to harden their homes to be more fire resistant. Unfortunately, not everyone has learned from the past. County planners continue to allow new subdivisions in the Wildland-Urban Interface (WUI) without adequate egress, resources, or community fuel breaks. Life, habitat, critical infrastructure, and property are at risk when firefighters have limited access and nowhere to stage a defense. Community fuel breaks near the wildland urban interface provide necessary space for firefighters to do their job. 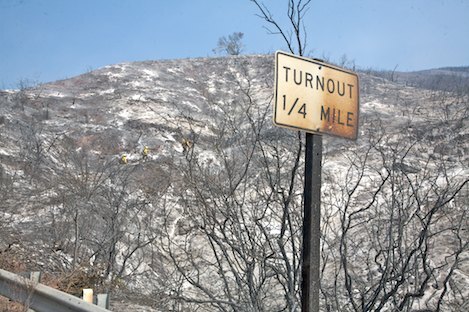 Wildland residents initiated the process of creating a Community Wildfire Protection Plan for the San Marcos Pass/Eastern Goleta Valley Mountainous Communities several years ago. With assistance from local government, a development team was assembled to draft the plan. Through thousands of collective hours, scientific analysis, and consultation with experts in the field, this diverse group of wildland residents, firefighters, forest officials, neighborhood representatives, scientists, and environmental advocates worked together to draft a CWPP. The purpose of a Community Wildfire Protection Plan is to identify and prioritize areas for hazardous fuel reduction treatments and recommend current best management practices as to the types and methods of treatment that will protect at-risk communities. Additionally, CWPPs recommend measures to reduce structural ignitability. Developing a CWPP does not commit the at-risk community or the County of Santa Barbara to carrying out, funding, or issuing a permit for any treatment. Recently an attack on the development process has garnered much attention from local media. The sudden resignation of two team members and the environmental groups they represent has caused public confusion and speculation regarding the future of the plan. Vegetation management is at the center of the debate. Sadly some cannot see the forest for the trees. After 28 years and multiple wildfires, the Paint Fire ranks at number 13 on the list of the most devastating fires in California history. It is still the fastest moving and most destructive fire Santa Barbara has ever seen. I lost everything in the Paint Fire and clearly recall the trauma of running for my life. When the fire came, it roared down my street with no warning, leaving only minutes to escape. Thick black smoke filled the air, blocking all sunlight. Local roads became snarled with traffic, making access difficult for firefighters and trapping residents trying to flee. Many abandoned their cars and ran. Pasture gates were flung open, sending livestock running in all directions. One woman, Andrea Gurka, perished while trying to escape what some recall as “70-foot flames.” Charred remains of horses and wildlife were buried among the rubble. Those images are impossible to erase. After every fire, inevitably someone reminds us material things are replaceable and houses can be rebuilt. Rebuilding a house is easy; rebuilding a home takes a lifetime. Fear remains forever. For fire survivors and the firefighters who protect them, the memories are painful and the fear is real. But we don’t let that deter us from taking action against the next inevitable fire. On the heels of the Jesusita, Tea, and Gap fires, Mission Canyon, Montecito, and the City of Goleta developed and approved CWPPs for their communities. In the meantime, mountain and foothill residents along San Marcos Pass remain vulnerable. Their efforts should be supported, not harmed with half-truths. For more information please visit the Eastern Goleta/Mountain CWPP website. Kendra Duncan O’Connor is president of the San Antonio Creek Homeowners Association and a member of the CWPP development team.